Help those who might be agitated to relax with this collection of comforting and familiar sights, sounds and smells. 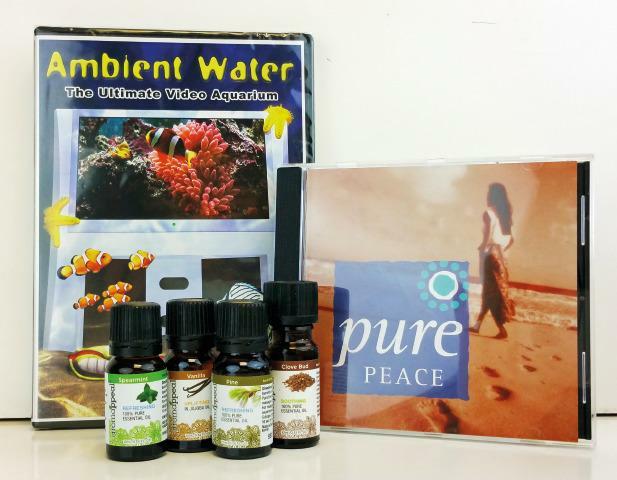 The Ambient Water DVD includes 190 minutes of the most amazing saltwater and freshwater aquariums. Special features of this DVD include eleven scenes (10-30 minutes each), loop scenes for continuous play, aquarium sound effects and music and much more. The Pure Peace CD offers the most restful and uplifting arrangements. Total running time 42:06. Deeply relaxing music ideal for quiet reflection on lazy days and restful evenings. The Reminiscent Aromatherapy Kit includes some very familiar scents to spark a memory or start a conversation: Spearmint, Vanilla, Pine, Clove.